Hello Piso Fare friends! You can have happy moments this month if you will get the new promo deals of Cebu Pacific Air 2016 to 2017! Why? Will you not be happy if you can obtain promo tickets for your December 2016, January, February and March 2017 vacation? Promo include domestic and international destinations. The famous Boracay and Puerto Princesa are among the local places covered by the promo. For international routes, trip to Hongkong, Macau, Nagoya, Bangkok, Dubai and many more places are available for booking. The sale seats can be booked starting today until November 17. Promo fare tickets are LIMITED and subject to seat availability. Book fast to get the lowest fare!!! Promo tickets of Cebu Pacific are good for one-way trip with 7 kilos handcarry bag. For checked baggage, you may pre-purchase a Baggage Allowance so you can save on baggage fees. If your desired travel destination is not included in the advertised promo, it is best to do trial booking online to check for other Cebu Pacific low fares. For example, the Bacolod to Davao flight is not mentioned in the promo, yet when I did online booking, promo ticket for this route is also P999 which covers the base fare, web admin fee, taxes and fees. Be flexible and search for other dates when promo tickets for your desired flight date is no longer available. Shared below are promo tickets we got via online booking at Cebu Pacific website. You see, the promo is authentic. Check this sample of Manila to Hongkong international promo. 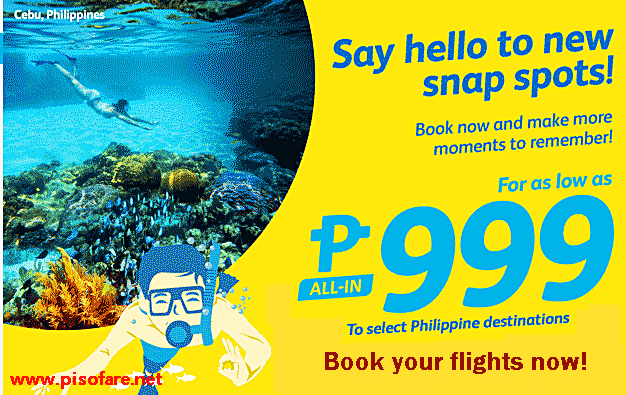 Get your cheap Cebu Pacific tickets by booking online at www.cebupacificair.com. No Promo Code needed when booking on this sale. Limited seats on sale! Sale seats may not be available on all flights! First come, first serve basis! LIKE and FOLLOW us in Facebook: PISO FARE Tickets for more promo fares, PISO FARE and travel tips!! !